Zerodha Kite 3.0 is one of the newest web trading platform from Zerodha. In this article, we will discuss in details about various features of Zerodha Kite 3.0, its set-up process, charges & more. Zerodha is one of the best discount brokers that offer trading services to sell and buy market shares. Kite is easy to use an online trading platform of zerodha, where traders and investors can optimize their trading performance and manage market via a financial intermediary. Zerodha always trying to implement high technology in its web services so that users can experience great interface when they open an account. Recently launched Kite 3.0 has proved that a company is really doing something appreciable for its traders and investors. From the easy to trade unique features to professional help, you will get everything in this kite 3.0 beta. Now customers can take advantage of updated version and understand more about the market and initiate decision carefully. Dashboard of any app summarize the story of your account. So, it needs to be clear and user-friendly. The only difference you can observe in this new version is that you can search for scrip and place an order whether you want to buy or sell, along with that you can check the quantities of equity holdings on the watch list. Customers who are using Kite for trading, they want bracket and cover orders to remove all confusion. A bracket order associated with three aspects that are Target order + Initial order+ Stop Loss order and it’s for an intraday trader who wants to take pros of this new feature with minimum risk. And a cover order is a high margin order which is a place with a stop loss order, keep in mind the Zeroadha give access placing orders for Equity, currency, f&Q and MCX. Now you can take advantage of this Kite3 version in order to see history from Q. Along with that you can access also extract tables in CSV. There are lots of shortcut keys are available in the window. With the help of these keys, you can easily place buy and sell the product for intraday trading. If you use this kite3 version, you would find the range selector at the bottom of the page, by clicking on this you can quickly navigate to the range of your demands. This feature makes charting more powerful now you can check the performance of holdings in the evening. How to Setup Zerodha Kite 3.0? Setting up a Zerodha kite 3.0 web platform is a very simple process. Once you login to the account successfully, you will find here the option which is called the market watch. Click on this option and type share name. You can also find the drop box on the page itself, where you can select the share which you want to buy or sell. After selecting a share option, there will be an add button, just click on it and add your share to the market watch. Once the share added to your marketplace, you will find options like buy, sell depth, and chart on your share. Hit press on the buy button adjust the quantity of the shares and submit the buy order. Finished. These are various options which is available to a client to set-up their Zerodha Kite 3.0 Account. How to own Zerodha Kite 3? To own and trade via Zerodha Kite3, you need to open a zerodha demat account. The Zerodha Kite 3.0 is absolutely free with Zerodha Demat Account. There are no charges involved in using Zerodha Kite3. Here, mentioned a quick guide that will help you in setting up an account. Enter all your details such as Name, mobile number, and Email. Convenient: Kite3 online trading service is good to go, all you need is to do, just enter your Id and password and then start trading from anywhere on any platform. Eliminate Middle Man: There is no place for a middleman in online trading. You can trade virtually with your own mindset skills. Moreover, your profit is total, there is no sub-division. Quick Transaction: With the help of net banking people can easily initiate the amount from one account to another account instantly. Investors have great control: Online traders and investors can use this service whenever they want to. As mentioned above faster transaction eliminates the waiting list, people buy and sell shares on a single click, so it is easy for investors to monitors their option rather depend on the brokers. No personal or professional relationship with the broker: As kite3 is an online trading web tool that enables users to buy and sell shares according to their credibility. This aspect is good for elite traders, but novice traders’ needs guidance and support so that they can invest in the right place. Too much dependence on the Internet: Kite3 is an online trading platform, ultimately all the process depends on the internet, so if the connection is slow and then that time value of a share is high, you may lose the lucrative trade. Computer glitches: Online trading services are only good when your computer and the internet is good. If one them gets fail it can cause big trouble for you. If you serious about stock marketing, and seeking for the best web online tool that will guide and gives you the profitable result, then Kite.3 is all yours. With the advanced technology and features it is easily accessible and anyone can use it effortlessly. The tool also engages traders and investors in multiple tasks which means manage several accounts simultaneously. 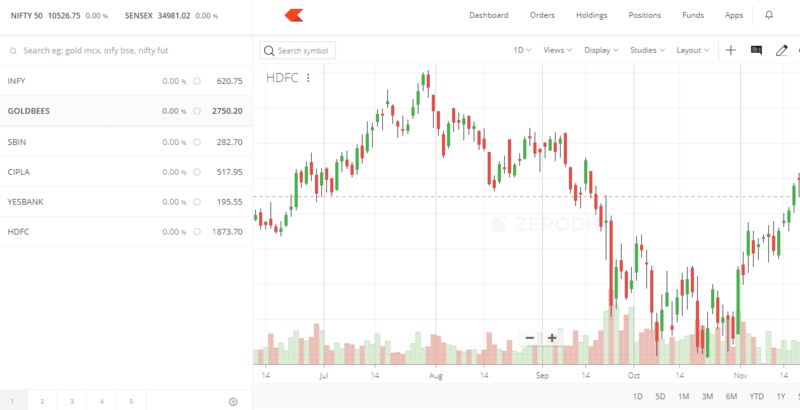 Zerodha knows every second is very valuable for investors as well for the traders in the stock market so they design every tool technical glitches free. Most importantly, your privacy is Zerodha first priority, all the transactions details are only up to you.